The Indian Institute of Astrophysics owes its birth to the vision and dynamism of M.K.Vainu Bappu. Vainu Bappu is also responsible for the revival of optical astronomy in independent India. 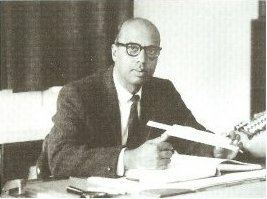 In 1960 at the young age of 33, when Bappu arrived in Kodaikanal as the Director of the Observatory, he had already established himself as India's foremost optical astronomer. The seminal paper on the Wilson-Bappu effect had been published three years earlier and had opened up a new field of study - stellar chromospheres. As primarily a solar observatory, Kodaikanal had made impressive strides in solar work but the facilities at the observatory were inadequate for night time astronomy. While Bappu directed the solar work with dedication, he also started looking for a good astronomical site in peninsular India where a stellar observatory could be built. A decade-long effort led him finally to a spot in the Javadi Hills of Tamilnadu, next to the village of Kavalur, where he established the premier stellar observatory of the country. He undertook the pioneering though arduous task of building indigenuously a large optical telescope for the observatory at Kavalur. In 1986, when the late Prime Minister Shri Rajiv Gandhi inaugurated the indigenuously built 234-cm telescope at Kavalur, both the telescope and the observatory were named after Vainu Bappu, who had died rather suddenly in 1982, before the completion of his dream project. Soon after coming to Kodaikanal, Bappu had also initiated action to create an autonomous research institute, which led to the formation of the Indian Institute of Astrophysics in 1971. Today IIA has three field stations - the solar physics Observatory at Kodaikanal, the Vainu Bappu Observatory at Kavalur and the Indian Astronomical Observatory at Hanle in Ladakh. The Institute has its headquarters in Bangalore and another campus in Hoskote, the remote station to operate its telescopes in Hanle. The Institute also runs in Gauribidanur a low frequency radio observatory for solar observations.